QuadrigaCX Bitcoin exchange announced to have lost USD 145 million worth of cryptocurrency because the only person with access to its cold storage has died. QuadrigaCX, the major Bitcoin exchange in Canada announced to have lost CAD 190 million (USD 145 million) worth of cryptocurrency because the only person with access to its cold (offline) storage wallets has died. This person was Gerry Cotten, the founder and chief executive officer at QuadrigaCX. The Canadian exchange filed for legal protection from creditors in the Nova Scotia Supreme Court until it locates lost funds. The bankruptcy hearing for QuadrigaCX is scheduled for February 5 at the same court Nova Scotia Supreme Court. 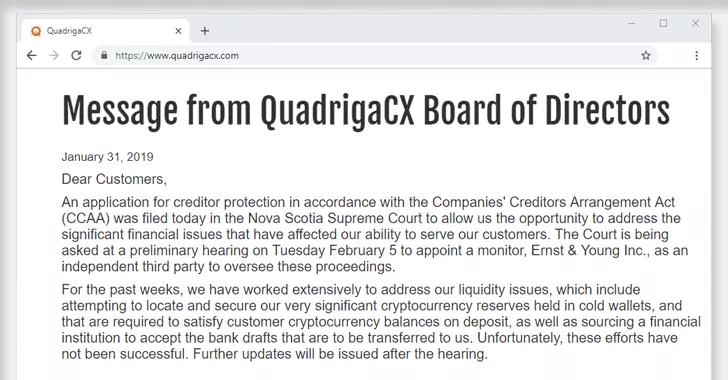 “In a sworn affidavit filed Jan. 31 with the Nova Scotia Supreme Court, Jennifer Robertson, identified as the widow of QuadrigaCX founder Gerald Cotten, said the exchange owes its customers roughly $250 million CAD ($190 million) in both cryptocurrency and fiat.” reported Coindesk. “The company previously announced it had filed for creditor protection on its website, but the filing itself provides greater details about its predicament. According to a sworn affidavit filed by Cotten’s widow Jennifer Robertson, QuadrigaCX was maintaining some CAD 260 million (USD 198 Million) in both cryptocurrencies (Bitcoin, Bitcoin Cash, Litecoin, and Ethereum) and fiat money. The majority of the funds was stored in a cold wallet, just USD 286,000 were stored in the hot wallet of the company. A ‘cold wallet’ is used by exchanges to protect the funds from online threats, for this reason, it is a physical device that is isolated from the Internet. The cold wallet was protected with a private key that was known only by Cotten, who unfortunately died of Crohn’s disease on December 9 in Jaipur, India. Cotten’s wife declared that no other members of the company was in possession of the key to access the funds. “For the past weeks, we have worked extensively to address our liquidity issues, which include attempting to locate and secure our very significant cryptocurrency reserves held in cold wallets, and that are required to satisfy customer cryptocurrency balances on deposit, as well as sourcing a financial institution to accept the bank drafts that are to be transferred to us. Unfortunately, these efforts have not been successful,” reads a message posted on the QuadrigaCX website. Some experts don’t believe in the version provided by the QuadrigaCX team, they speculated that QuadrigaCX never dad $100 Million in is pool of funds. If confirmed, the company never had a cold wallet storing such amount of funds. Is this an exit scam? “The number of bitcoins in QuadrigaCX’s possession is substantially less than what was reported in Jennifer Robertson’s affidavit, submitted to the Canadian courts on January 31st, 2019,” reads the @zeroresearchproof/quadrigacx-chain-analysis-report-pt-1-bitcoin-wallets-19d3a375d389">post published by the researcher on Medium. The only certainty is that thousands of users would never be able to access their funds.